I Beaune, på kanten af ​​vandet ret "Bouzaise Den" hus af XVIII renoveret med en lukket have med stenmure. Dette hus indeholder et køkken åbent til stue med udsigt over haven og terrasser, en læ. Ovenpå to soveværelser, et med en seng på 160, den ene med bruser og seng 140, badeværelse med bruseniche, separat toilet. Lovely place. Very non-descript from the outside but all is very nice inside. Close to center of town with a 5 minute walk. Very comfortable. All systems working well. Back patio is delightful. We made dinner for the 4 of us twice using the charcoal grill. Great place to have dinner and a glass or more of wine. Would definately stay again. 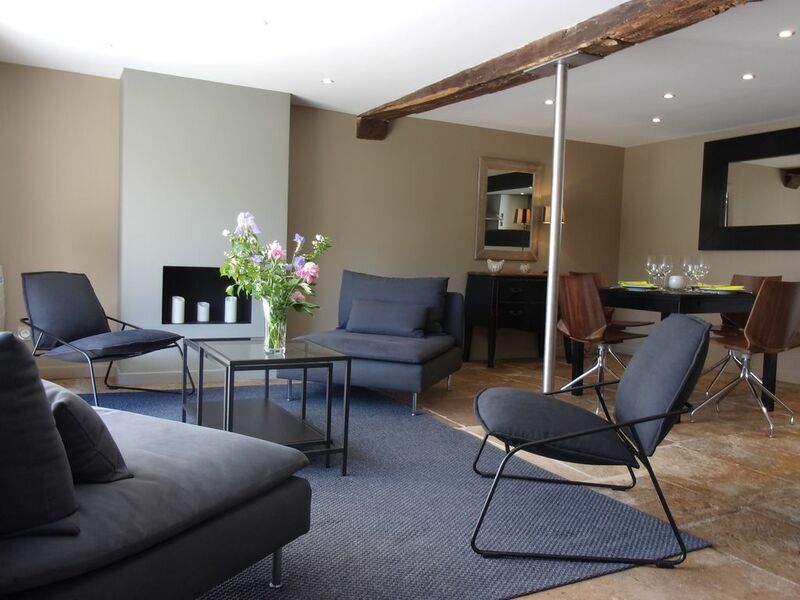 This property checked all the boxes – modern, clean, close proximity to the attractions of Beaune with all the amenities we needed for a week-long stay. The kitchen was small but well equipped. The interior seating area was spacious enough that the four adults in our group never felt crowded. We also took advantage of the outdoor courtyard every day. Charlotte was very responsive to our trip planning questions and her mother gave us excellent recommendations for nearby restaurants. We are planning to return for a longer stay. I highly recommend this property. The accommodation was tastefully furnished and decorated and well equipped. We had everything we needed and loads of space to sit outside in very quiet surroundings. The owner was pleasant and helpful and on hand to sort out the one minor problem we had getting tv reception. Very convenient for the town centre with plenty of restaurants, patisseries and other shops and handy, of course for places to sample and buy wine. Absolutely great location for staying while touring the Burgundy region of France! This apartment is a very clean, quiet, well-decorated, well-equipped rental. We especially enjoyed the private outdoor courtyard. It was a great spot for morning coffee or afternoon wine. The location is great for walking to the many restaurants and wine tasting venues. It was also near the Saturday market...beautiful! There is conveniently located on the street parking nearby. Charlotte is very easy to work with and quickly responses to messages. We hope to visit again. We loved Beaune and really enjoyed this rental. This is a very special property, an old village house which has been renovated in modern style with all conveniences. The location is perfect, on the outskirts of the central town, but within 10 minutes walk of every museum, shop, restaurant. In the other direction is a park, bicycle paths and vineyards. The garden and terrace are fantastic, including a covered area where we took our meals when it was raining. Charlotte and her mother were very warm and welcoming. We loved this place and our stay here. Great location. Needs some tweeking. There is only one toilet which could be an issue if there were four people staying there. Good thing there was only the two of us. There is no microwave and fridge is tiny, as is the kitchen. We both are good cooks but it took some manuevering to make a meal. They need a fry pan. The location was ideal and we loved it for that reason!